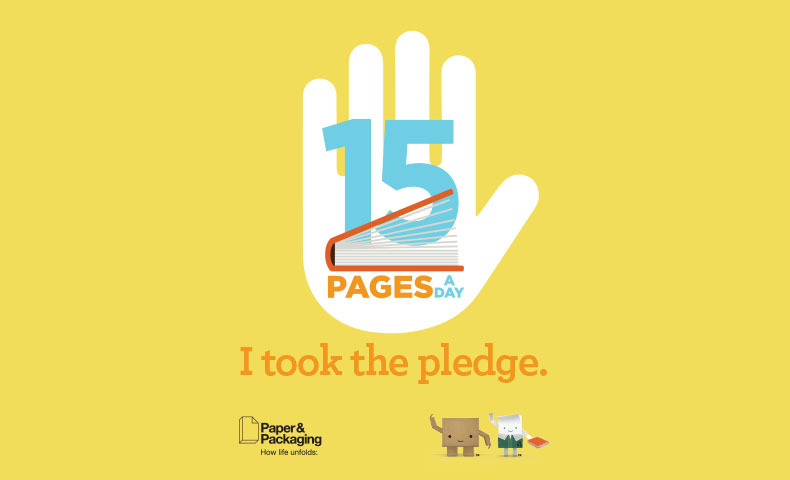 The Paper and Packaging Board’s 15 Pages A Day campaign, which promotes reading on paper and illustrates the benefits of reading 15 pages each day, has recently made its way to classroom curricula around the country. Through a partnership with Young Minds Inspired (YMI), the Paper and Packaging Board is promoting a classroom reading goal of 15 pages every day. The Paper and Packaging Board developed a curriculum and various in-class activities to reinforce the idea that paper is an important and primary teaching tool in schools. Together with YMI, they also developed a summer reading list for students of all ages and interests. YMI is the nation’s leading provider of free educational outreach programs for learners of all ages. YMI distributes its programs free of charge to members, including more than 2 million teachers at public, private and parochial schools in the United States, Canada and Latin America. Every YMI program is developed by curriculum experts and reviewed by members of its Educator Advisory Board to ensure that programs align with academic standards and meet practical classroom needs. The 15 Pages A Day curriculum was sent to 10,000 teachers toward the end of the 2017–2018 school year. It reached more than a million students with items such as a large poster with suggestions for a summer reading list, three classroom activities, curriculum standards and a complete teaching guide. This classroom reading goal was fully supported with all the materials needed to succeed. Why Set a Classroom Reading Goal? Reading 15 pages a day on paper offers a wealth of benefits, including increased language and mental development and improved memory. Setting a daily classroom reading goal can help improve educational outcomes for students. This reading goal is manageable if you decide your 15 pages a day can be anything you want. Parents can read a book to their kids, business professionals can print out emails to refer to or notate, and students can take a break from the computer and read from a book or handwritten notes. Are you ready to take the 15 Pages A Day reading pledge? Learn more about the program and how you can set a classroom reading goal for your students.